Thanksgiving used to be a holiday I didn't much enjoy. Usually it was spent with extended family where we all practiced emotional contortionism and there was more biting of tongue than turkey. However, for the last four years (and we are looking forward to our fifth), we have embraced Thanksgiving and formed new treasured tradtions. Years ago we decided we just couldn't please everyone, and we were rarely pleasing ourselves. We had special diets to consider, young kids and like-minded friends new to the state and with no family to spend the holdiays. So we combined efforts and have been celebrating the holiday together since. We used to trade hosting duties. That was fun, but not as relaxing as we wanted. Then our friend suggested renting a cottage belonging to another friend. Genius! We still have to do a little bit of driving, but it's well-worth it. This cottage is small but holds all six kids and four adults easily. The cottage is sited near a large pond in the woods. It's private. It's warmed by the woodstove. It's gorgeous, homey, welcoming--and for twenty-four hours, it's all ours. Each family makes up whatever food we want, packs it up and brings it to the cottage. Since our friends live somewhat closer than we do, we always arrive at a warm and cozy cottage, mashed potatoes in the mixer, pies on the counter and turkey in the oven. We always bring too many pies (ten people cannot actually eat ten pies in twenty-four hours, we try every year and fail) and we somehow manage to fit all our leftovers into the small fridge. 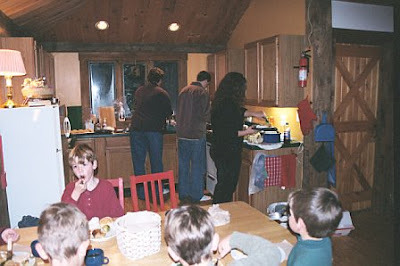 While the adults get the food out, the guys check the woodstove, again, the kids catch-up, and it's not long before they start clamoring for fooooooood! The only entertainment is the cd player playing selections from our Yule music collection, cards, board games, Mad Libs and Legos. Once outside, the kids have the entire woods where they build dams and forts and play flashlight tag. The adults alternate between cleaning-up, relaxing, chatting, eating and feeding the six hobbit-like children who adhere to second, third, fourth and fifth dinners. After many games of Hearts and crazy Mad Libs, we all get into pjs, we fire up the stove and we eventually get to bed, one family upstairs in the loft, the other downstairs. Every year we reminisce about previous years (well mostly--no one wants to redo the year I had strep the entire holiday); remember the year we woke to snow, the woods frosted white? Remember the sheets of ice down by the pond? Remember the year J complained and complained how full he was and two minutes later he got up to get pie? Yes, we remember. I think the best part of it all is that it's informal, it's simple, and it's ours. These are our traditions that we made. Other than some favorite family recipes being shared (my mom's scalloped corn, H's biscuits, Alex's cranberry fig chutney), there are no leftovers at the cottage other than those of the edible variety. So let the pie-making begin--I wonder if ten will be enough? This is prefect way to celebrate! I love the idea of the cabin. I wish we could do something like this. I bet the kids just love it! Those pies look so yummy! Enjoy your friends, the cabin, the food and your family! That sounds like the absolute best way to celebrate! We have been wanting to cut back on the stress family thing, and take this holiday for ourselves to get out in the woods and be quiet and eat good food (this is to be out last year before saying, oh, the boys are old enough now so we are gone on these two holidays now!). Having like minded friends in the mix is awesome - that is something we have really hoped to find here...but it isn't easy! That looks like a lovely place to be.